Pet Wants SpringfieldMO: Can Changing Seasons Affect Your Pet's Mood? Can Changing Seasons Affect Your Pet's Mood? Just about everyone has heard the phrase winter blues. However, many people don’t know where this term originated from. Winter blues refers to the fact that some individuals are negatively affected by the shift to winter. Known as seasonal affective disorder (SAD), this condition affects between one and ten percent of the population depending on the specific location. Common symptoms include feeling depressed, having little energy or sleeping too much. What sets this condition apart from other forms of depression is the symptoms will naturally go away on their own during the brighter and warmer months of the year. Although research into this issue with pets isn’t as extensive as with humans, a number of researchers and organizations have collected data about SAD symptoms in pets. 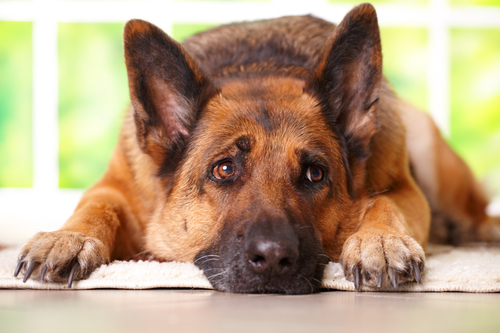 Given that the prevalence of this symptoms has been shown to be as high as thirty percent, most experts who have looked into the issue have come to the conclusion that it would be very surprising if SAD didn’t exist in animals (especially domestic ones). Whether you’ve noticed your pet acting a little more down than normal or you want to take action now to help prevent any blues from setting in, the good news is there are definitely ways you can help. The first is to stay active. While you’ll want to protect your pet from harsh weather conditions, getting outside is a great way to lift both your spirits. The second tip is to feed the right amount of food. Not overfeeding your pet will prevent winter weight gain. To ensure your pet gets all the nutrients it needs without consuming an excess of calories, we offer less active dog and lean cat blends of our high-quality food. Finally, if your pet seems to have a really tough time when the seasons change and you’ve gone to your vet to rule out any other medical conditions, it may be worth investing in a light box. This type of treatment is a common option for people struggling with SAD. You can actually find a device known as the Sol Box that’s specifically designed for dogs and cats. By paying attention to your pet’s behavior and taking any necessary actions like changing food portions, you can help your dog or cat continue feeling its best until spring comes around again!